Take another head pin and slide on a bead cap, followed by a wing bead. Leave a gap between the wings (see photo). Place the head pin through the loop and slide on another wing bead and cap. Then fold over the end of the head pin (snip off the excess) and tuck the end down onto the bead cap as shown below. Do this again to create another set of wings. Push the large head bead onto the head pin. Turn over the end with about 1 cm at the top to turn over. Turn a large loop at the top of the head, then wrap the pin, as shown, around the main loop, leaving a small gap for the neck. Then, tuck in any loose ends as shown below. Take a coil of wire and wrap it around the wire between the top of the 12mm bead and the large loop until firmly attached. Load 4 (more if you need them) bicone beads. Circle the wire around the neck of the dragonfly, twice, then load 4 more beads (more if you need them) and come back down to the bottom. Again wrap it at the top of the 12mm bead. Load 4 (more if you need them) & continue until the area is full. Turnover the dragonfly and do the same on the other side. During the process wrap any excess wire between the wings to strengthen them. Attach the bail by closing the top loop. 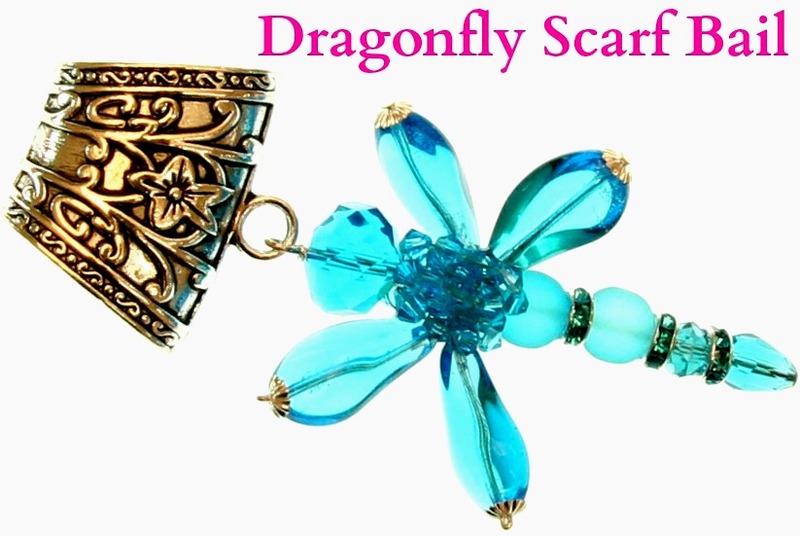 And there you have it, your very own Dragonfly Scarf Bail! Tune in to see Trish’s very first Indivijewelistic shows on Hochanda on Monday 8th August 3pm and 6pm!